The metrics calculations are based on nearly 3.5 billion views. The stats are collected from 2700+ media servers (Nimble Streamer and Wowza). Protocols share remain stable, i.e. 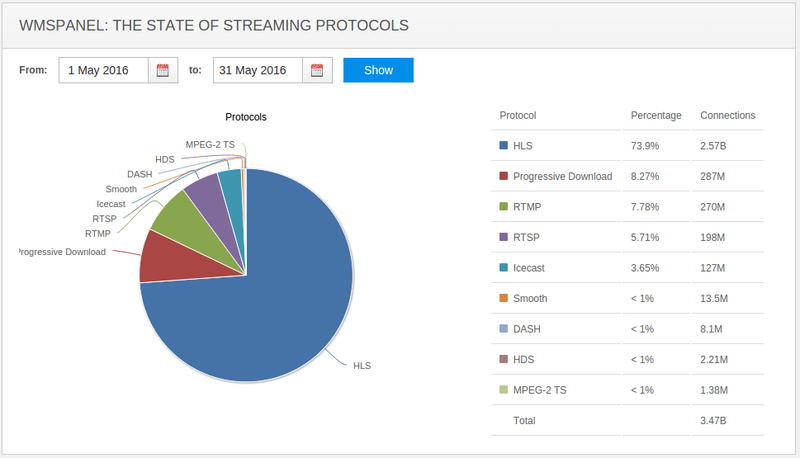 HLS share is about 73% with progressive download having 8%. 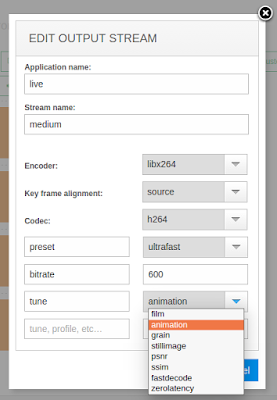 Live Transcoder for Nimble Streamer allows using various FFmpeg filters for transforming content. 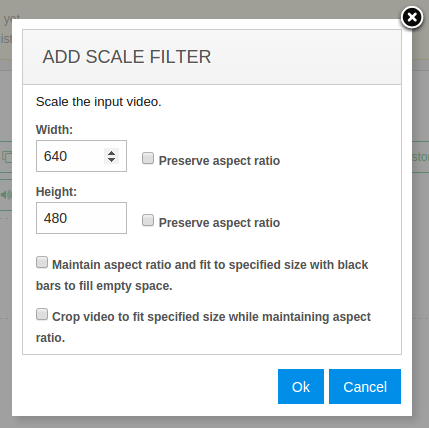 Some filter are implemented as transforming blocks in transcoder UI which you may see in our videos. However, there are tasks that need non-predefined filters. De-interlacing is one of those tasks and FFmpeg has yadif filter which is described in this article. Let's see how this is done in Transcoder web UI. 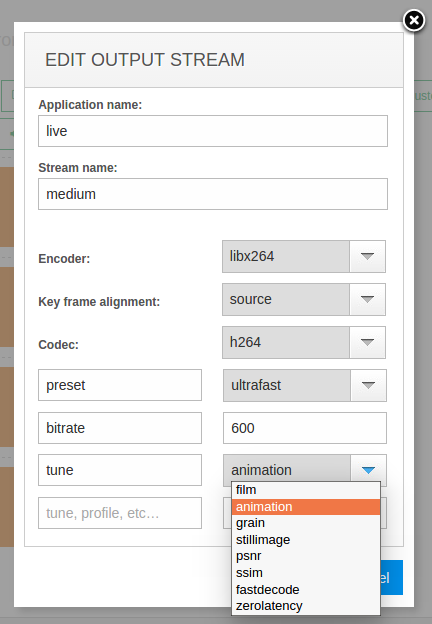 First you go to Transcoders menu to create new scenario or open existing one. 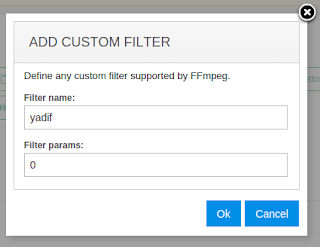 After adding decoder element with incoming app and stream names, you need to add custom video filter with "yadif" as filter name and zero value. You should add de-interlacing filter before any other content transformation. This will allow preserving image quality for further changes. So if you'd like to add some additional filters like scaling, you can add them right after "yadif" filter. 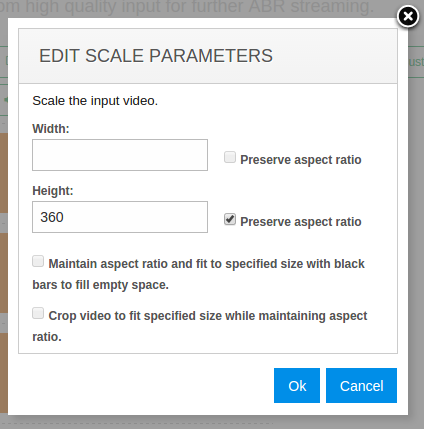 So your final version of transcoding scenario with de-interlacing and scaling will look as shown below. 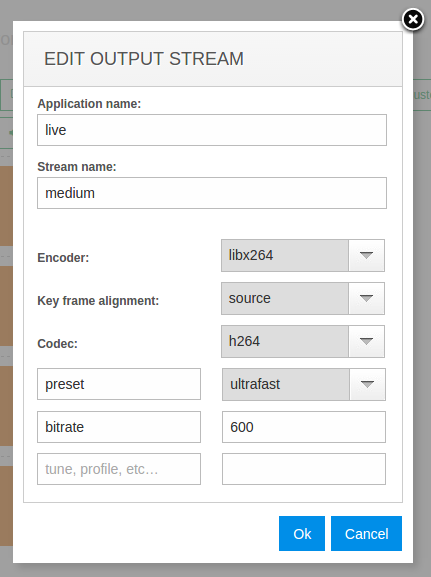 Live Transcoder for Nimble Streamer has wide range of transcoding capabilities which include H.264 encoding. It currently uses x264 library licensed for commercial usage and any customer with our Transcoder may use x264 parameters to set up outgoing stream. 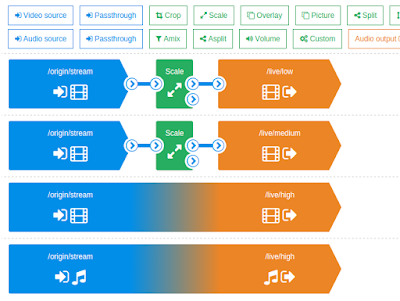 This article gives some details on encoder parameters usage. 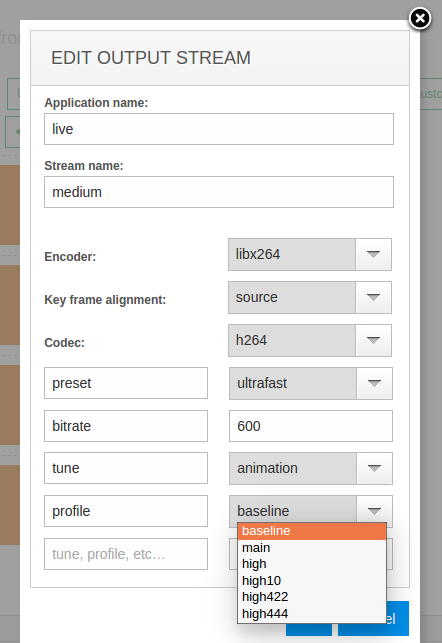 As you may have seen from our screencasts - such as UI sneak preview for ABR scenario setup - you need to set up transcoding scenario with source streams, transformation blocks and encoder. You can see blue block being sources of streams, green blocks for filters to transform the content and orange blocks as outgoing streams encoders. If you point your mouse to any block, you'll see setup icon - you can clock on it to see details dialog. As example, here's a dialog for "medium" stream scaling filter which sets it to 360p. 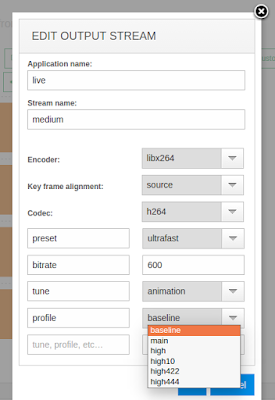 Currently we support x264 encoder, let's take a look at its parameters. Key frame alignment allows arranging key frames according to selected approach. They are described below under the screenshot. 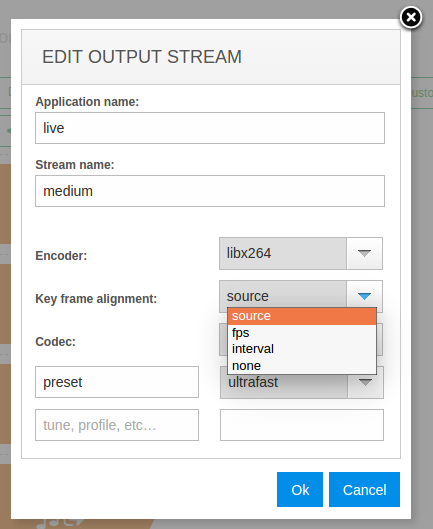 Keeping source key frame alignment is a required feature for creating ABR streams. The key will be aligned same way as they are aligned in source stream. So if you use it for ABR, you need to use it. This feature is not available when you use FFmpeg as a command-line tool. FPS value will insert the key frame according to FPS amount defined in the opened edit box. Interval value will insert key frame in the time point specified as shown below. It is measured in milliseconds. As example, if you have 0 frame at 5900, and 1 frame at 6100, then you set this value to 6000. In this case a new frame will be inserted at 6000, copied from nearest older frame which is 5900. Having "none", the key frames will be defined by the encoder, the value will be determined based on preset and tune parameters. 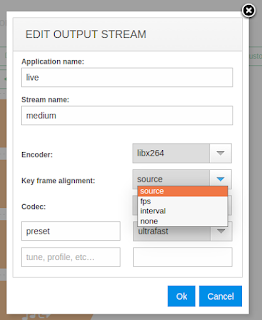 There's currently one codec used for video output so Codec field is not changed. Preset is selected among available presets which you can see on the screenshot below. 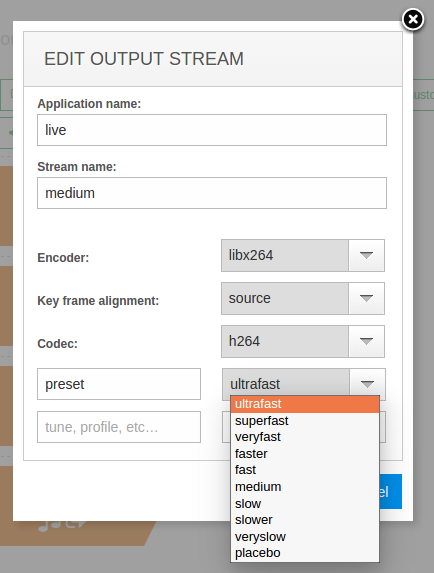 Add bitrate parameter if you'd like to set up the bitrate of outgoing stream. Its unit is Kbps so to have 600 Kbps you need to print "bitrate" in parameter name and then enter "600" in the right field as shown below. 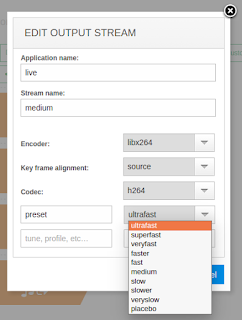 Notice: you can set constant bitrate for your encoded stream. To set up the "tune", type it in left field. In the right field you will be able to select value from dropdown list. The list of all presents and their meanings can be taken from x264 library documentation like this one. Profile is set by printing "profile" in the left filed and choosing the value from the drop down on the right. Typical values are "baseline" and "main". You may refer to X264 documentation like this one to see what else you can do with your encoder using various parameter. 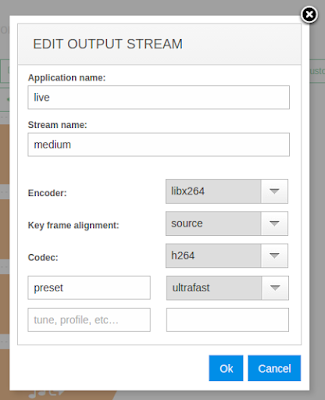 Setting those parameters will allow you to control your x264 video encoder more efficiently and make output streams according to your business logic. 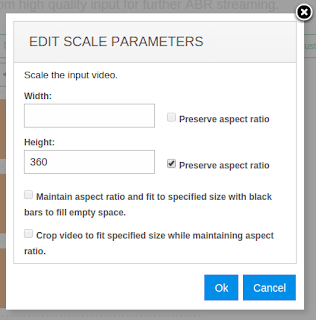 To set up audio encoding parameters, please check Audio encoder parameters video on our YouTube channel.